My mum is a chutney queen and every year she makes homemade chutneys, biscotti and limoncello or sloe gin to pack up for her friends. 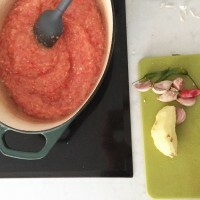 She’s the one who gave me the tomato chilli jam recipe below – it is simple to make but most importantly it tastes amazing. We pounce upon it and grieve when it runs out, so I thought it was about time I made my own. It is so blummin easy to make. I’d love you to have a bash. And if you’re in the mood to make more homemade goodies to gift this Christmas, or at any time of the year, read my article on all my favourite edible gifts here. Don’t be tempted to double this up in one pan as it will not cook evenly. If you want to make double, use two pans. You’ll also need a large saucepan – one that holds about 2 liters of liquid (70 oz), 6 empty jam jars, asilicone spatula and a ladle. A wide necked funnel is really handy too. Wash your tomatoes and cut them in half. Set aside. Chop the ends off your chillis but leave the seeds in. Put them into a food processor along with the peeled and sliced ginger and the peeled, whole cloves of garlic. Blitz until they turn into a smoothish paste. You may need to stop and scrape the sides of the bowl to get everything chopped. 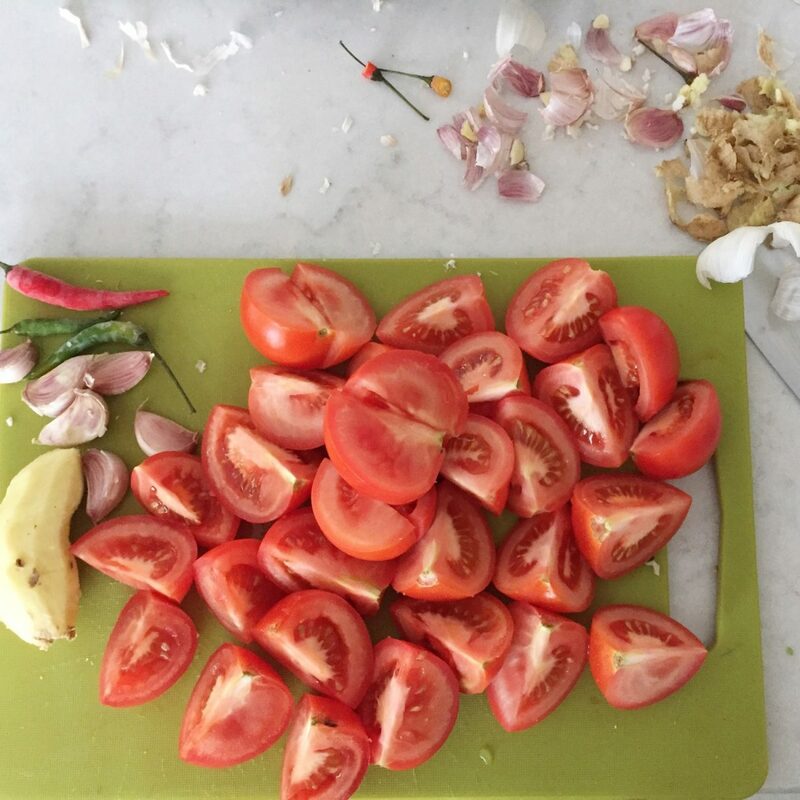 Add your tomatoes to the mixture in the food processor and blitz until they are pureéd. 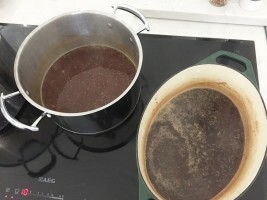 Pour the mixture into a large saucepan and heat until it bubbles. Stir well with a silicone spatula. Add the sugar, fish sauce and vinegars, stir and bubble with the lid off then drop the heat to a low simmer. Cook on low for 45 minutes with the lid off. Stir every 10 minutes through this next chunk of time and be sure to get all around the edges of the pan to avoid it catching. The finished jam is closer in texture to a sweet chilli sauce than a set jam so don’t worry. It will also firm up as it cools. While your jam cooks, wash 6 empty jam jars, rinse then put them on a baking tray along with their lids. Put into the oven for 15 minutes to sterilise them. Take your jars out of the oven and carefully pour the hot jam into the hot jars. Fill them almost to the rim and then put the lids on. Use a wide necked funnel to save your sanity I use a clean towel to do this to protect my hands from the heat. Leave to cool. Keep in the fridge or in a cold garage until you gift them or eat them. The jam will last, unopened in a fridge for 3 months. Once opened keep in the fridge and eat within a few weeks. I always like to write a tag with ways the jam can be eaten as some people may be baffled and try to put it on toast! Find more recipes for condiments/sauces, tomatoes and chilis here.